Do you want to know where all the NASCAR drivers, crews and officials eat when in Phoenix for the races? Well one of the “must go to places” is T-Bone Steakhouse nestled in the South Mountains. This place is one of the best kept secrets in racing! This photo doesn’t do the view justice. You have to see it for yourself. 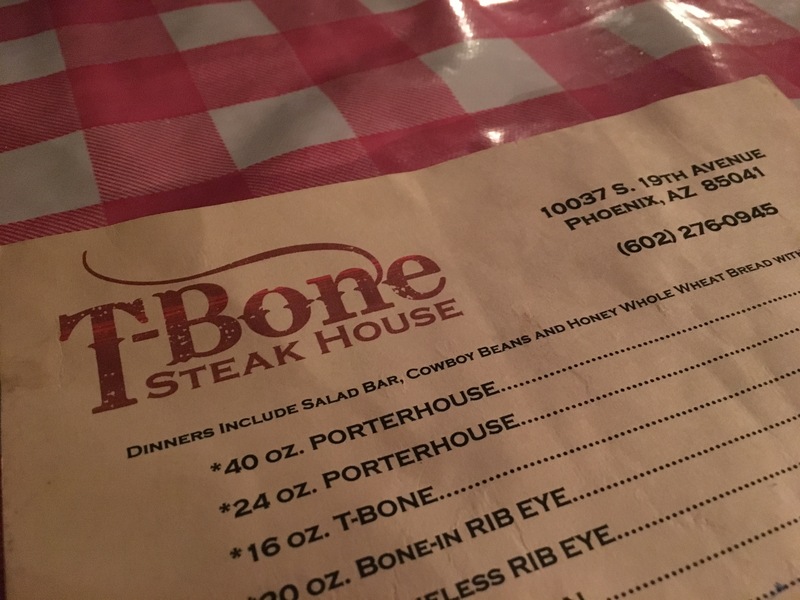 T-Bone is known for “simple steaks & seafood are fired up in this rustic Western roadhouse with valley views.” There you can experience casual dining with a beautiful view of the city of Phoenix. T-Bone’s is located in a structure that was built in the 1920’s out of river rock and adobe. It was a private residence until the 1940’s when it began to cater to nearby ranchers. In 1970 it was officially names T-Bone Steakhouse! Food, friends, view and great eats!!!!! For over 40 years this rustic restaurant has been serving simple delicious dishes of the “finest mesquite broiled steaks, salmon, trout, pork chops and chicken this side of the Salt River.” You literally feel like you have slipped back in time to a kind western friendly place. You can attempt the 40 oz Porterhouse Steak or enjoy the mouth-watering filet. Your meal will include a small serve yourself salad bar, warm fresh wheat bread and cowboy beans. Trust me when I say, you will not leave hungry!!!! ! rustic fun cowboy feel with great staff! plenty of additional seating out on the patio where you can enjoy your meal with views of the city or the beautiful South Mountains! The best thing is during NASCAR week in Phoenix its not unusual to see many of the teams having dinner here several nights in a row! NASCAR officials gather there at least one night during the races. Team crews go there for the reasonable priced filling meals after a hard day at the track. steak made to order exactly how I like it! So check out T-Bone Steakhouse, enjoy a wonderful delicious meal and I hope you run into some of your favorite NASCAR teams. You may even run into me!!!! ⟵Are You Ready to Head to the Races at PIR?